This will come as no surprise to any of you at this point — I hope — but it never hurts to see it again. The combination of the 1997 capital gains tax cut, the 2001 Bush tax cut, and the 2003 Bush tax cut has been fantastically beneficial to the richest of the rich in America. 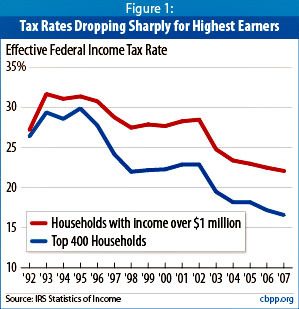 Most of us ordinary schlubs have seen our tax rates go down about three percentage points over the past decade or so. The rich have seen them go down about seven percentage points. And the super-duper rich? Their taxes have gone down nearly ten percentage points. It’s pretty nice having a bought-and-paid-for Congress, isn’t it?